The Raiders celebrate after senior Brett Sutherland tied the score in the first period of the Div. 3 North quarterfinal on Saturday. Watertown fell 3-2 to Dracut/Tyngsboro. BILLERICA — The Raiders battled to the final buzzer, but the Watertown High School boys hockey team could not find the back of the net for a third time, Saturday, and fell 3-2 to Dracut/Tyngsboro in the MIAA Div. 3 North quarterfinal. 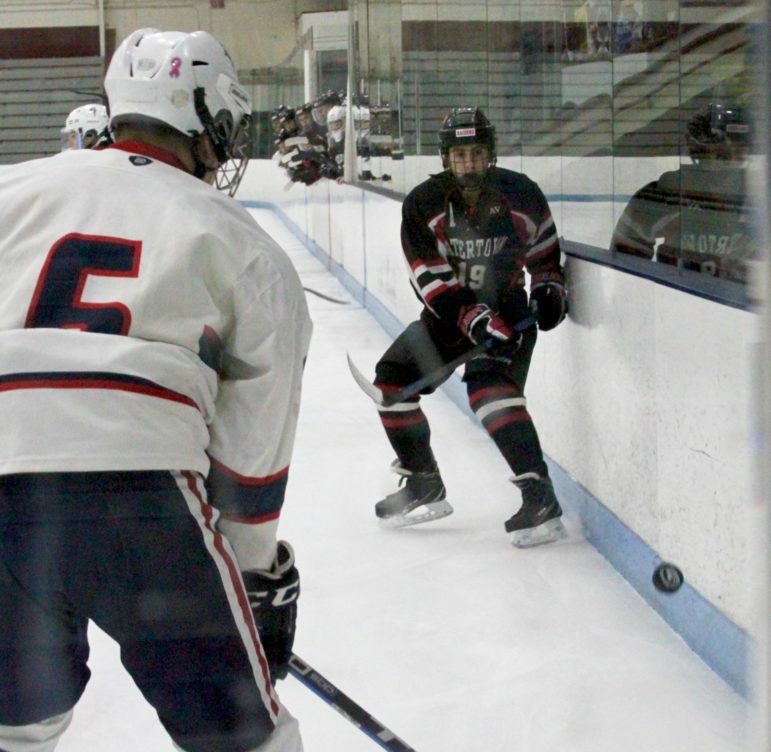 While his team performed better than he expected when the season began, Raiders’ Head Coach John Vlachos said the loss at Chelmsford Forum still hurt. 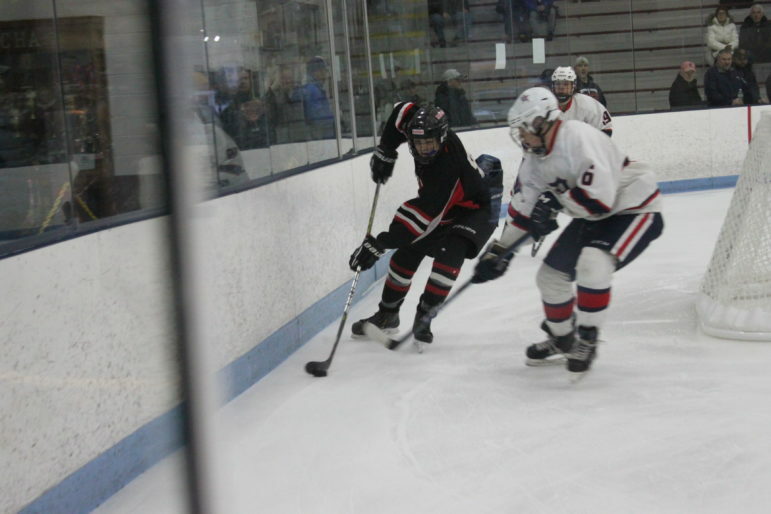 Watertown sophomore Nicholas DiPace hits the puck around the boards in the North quarterfinal against Dracut/Tyngsboro. The fourth seeded Middies got on the board first, just 2:19 into the game when senior Jake Callery scored on assists from sophomore Brian Workman and sophomore Jared Debruin. The Raiders, the 12th seed, conjured the scoring touch and scored twice in less than a minute of game time to take a 2-1 lead with 4:59 left in the first period. 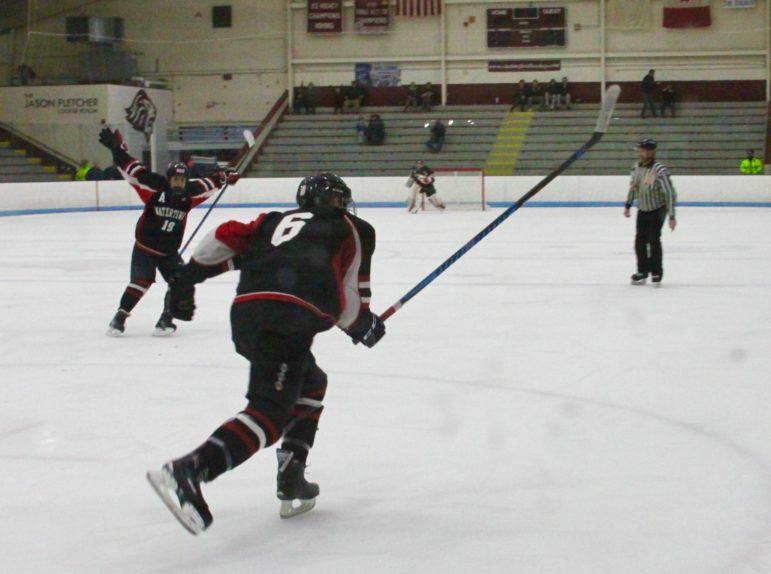 First, Watertown senior Brett Sutherland tied it up on a goal assisted by freshman Mason Andrade and senior Luke Murphy. Then senior Alex Egan scored 22 seconds later. Assists went to freshman Nathan Master and eighth-grader James Grady. Watertown senior Alex Egan pumps his fist after giving Watertown a 2-1 lead in the first period of the North quarterfinal. The teams battled during the first half of the second period, but neither team budged. Then, Watertown took back to back penalties, first a too-many men violation followed by a 5 minute major assessed to Murphy. The penalties overlapped for 51 seconds, but the Raiders were able to kill off the 5-on-3 advantage. With 4:06 left in the second, Callery struck again, this time on the power play. He was assisted by senior Kyle McManus and Workman. Watertown was able to kill the final 1:19 of the penalty to keep the score tied 2-2. Watertown junior goalie Kevin Greene makes a save against Dracut/Tyngsboro in the Div. 3 North quarter. Watertown had its chances in the third period, but it was the Middies who broke the deadlock. 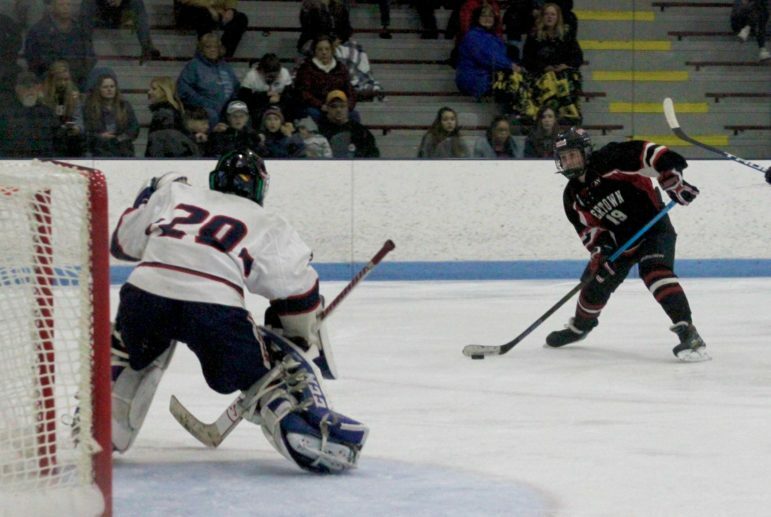 With 3:16 left in the third, Dracut/Tygsboro junior Pat Crowley scored on an assist from sophomore Mike Collett. Watertown called timeout and pulled junior goalie Kevin Greene for the final 1:35, but could not score. 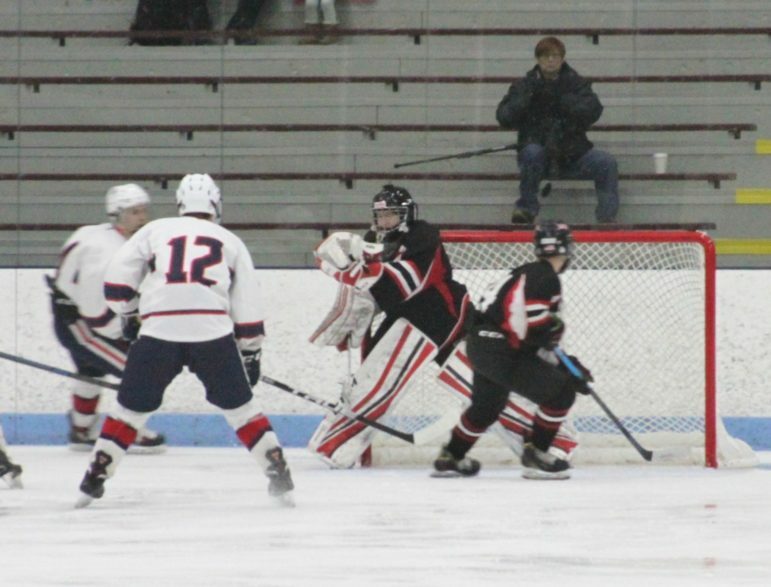 Watertown eighth-grader Anthony Venezia skates the puck behind the net in the North quarterfinal against Dracut/Tyngsboro. 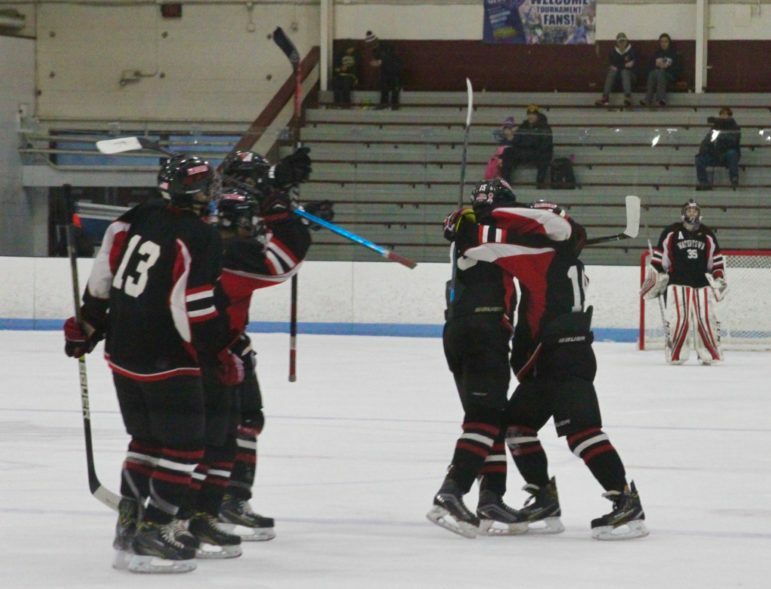 Watertown’s ends the season with a 9-9-4 record, and a first round state tournament victory over fifth seed Wayland on Thursday night. Still, the locker room was full of frowns after Saturday’s game. Watertown sophomore Nicholas DiPace fires a shot in the North quarterfinal against Dracut/Tyngsboro.